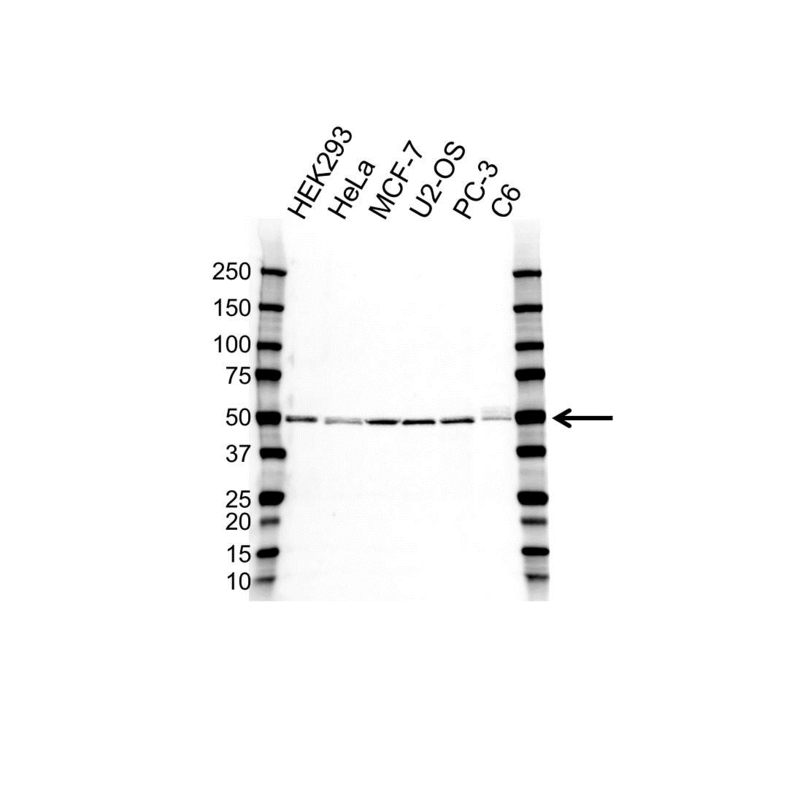 PSMC3 antibody recognizes PSMC3, also known as 26S protease regulatory subunit 6A, TBP-1, Tat-binding protein 1, or proteasome subunit P50. Mouse anti Human PSMC3 antibody recognizes PSMC3, also known as 26S protease regulatory subunit 6A, 26S proteasome AAA-ATPase subunit RPT5, TBP-1, Tat-binding protein 1 and proteasome subunit P50. The 26S proteasome is a multicatalytic proteinase complex with a highly ordered structure composed of 2 complexes, a 20S core and a 19S regulator. The 20S core is composed of 4 rings of 28 non-identical subunits; 2 rings are composed of 7 alpha subunits and 2 rings are composed of 7 beta subunits. The 19S regulator is composed of a base, which contains 6 ATPase subunits and 2 non-ATPase subunits, and a lid, which contains up to 10 non-ATPase subunits. Proteasomes are distributed throughout eukaryotic cells at a high concentration and cleave peptides in an ATP/ubiquitin-dependent process in a non-lysosomal pathway. An essential function of a modified proteasome, the immunoproteasome, is the processing of class I MHC peptides. PSMC3 encodes one of the ATPase subunits, a member of the triple-A family of ATPases that have chaperone-like activity. This subunit may compete with PSMC2 for binding to the HIV tat protein to regulate the interaction between the viral protein and the transcription complex. A pseudogene has been identified on chromosome 9 (provided by RefSeq, Jul 2008). Mouse anti Human PSMC3 antibody detects a band of 48 kDa. The antibody has been extensively validated for western blotting using whole cell lysates.